On the equinoxes the Sun shines directly on the equator and the length of day and night is nearly equal – but not quite. The March or Vernal Equinox is when the Sun crosses the celestial equator, moving from south to north. This date is considered to be the first day of Spring. A time of celebration - Many cultures celebrate the return of spring, the blossoming of nature or the rise of the vernal equinox. In Japan, the annual blossoming of cherry trees has become a significant national event. Hanami, or cherry blossom viewing, is a time for festivals and gatherings at parks and shrines, according to the Japan National Tourism Organization. Cherry blossoms, or sakura, symbolize the transience of life, which is a major theme in Buddhism. Also - Shunki-sorei-sai – Shintō (Japanese) The time of the spring memorial service, when ancestors’ spirits are revered at home altars and gravesites are cleaned and purified. Hebrew - People of the Jewish faith celebrate Passover, which commemorates when the Jewish people were freed from slavery to Egypt, according to History. The day falls on the first full moon after the northern spring equinox and lasts for seven days. Eve of Purim – Judaism A celebration of the Jews’ rescue from an evil plot to destroy them while they were living in Persia, the events of which are recorded in the Hebrew biblical book of Esther. The holiday includes reading the Megillah (the scroll of Esther), exchanging gifts, and special pastries called hamantashen. Christians - Spring in many countries with a strong Christian tradition is marked by Easter, which celebrates the resurrection of Jesus Christ and his triumph over physical death. However, it has roots in older traditions. "Easter is derived from a much older celebration of fertility and rebirth, the Celtic festival of Ostara," Cristina De Rossi, an anthropologist at Barnet and Southgate College in London, told Live Science. "The bunnies and the eggs are symbolic of fertility and reproduction." Buddhist - Māgha Pūjā (also written as Macha Bucha Day) is the second most important Buddhist festival, celebrated on the full moon day of the third lunar month in Cambodia, Laos, Thailand, Sri Lanka and on the full moon day of Tabaung in Myanmar. It celebrates a gathering that was held between the Buddha and 1,250 of his first disciples, which, according to tradition, preceded the custom of periodic recitation of discipline by monks. On the day, Buddhists celebrate the creation of an ideal and exemplary community, which is why it is sometimes called Saṅgha Day, the Saṅgha referring to the Buddhist community, and for some Buddhist schools this is specifically the monastic community. In Thailand, the Pāli term Māgha-pūraṇamī is also used for the celebration, meaning 'to honor on the full moon of the third lunar month'. Finally, some authors have also referred to the day as the Buddhist All Saints Day. Rama Navami (Devanagari: राम नवमी; IAST: Rāma navamī) is a spring Hindu festival that celebrates the birthday of god Rama. He is particularly important to the Vaishnavism tradition of Hinduism, as the seventh avatar of Vishnu. The festival is a part of the spring Navratri, and falls on the ninth day of the bright half (Shukla Paksha) in the Hindu calendar month of Chaitra. This typically occurs in the Gregorian months of March or April every year. Rama Navami is an optional government holiday in India. This festival is one of Hinduism’s most popular celebrations. People throw colored powder or spray colored water to celebrate episodes in the life of the god Krishna, and to symbolize unity and common humanity (since everyone looks the same when coated in colors). 4. Just for today, I will do my work honestly. 6. 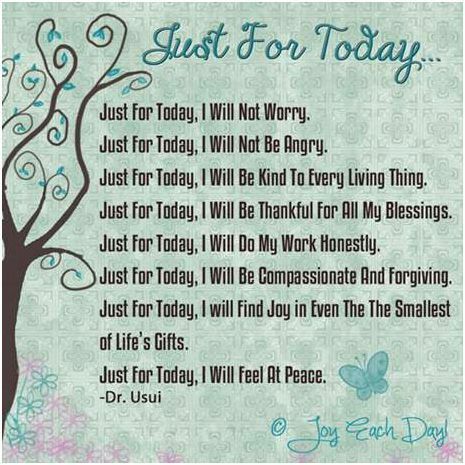 Just for today I will be kind to every living thing. The Human Body is in a constant state of renewal. Taste buds live 10-days, Red blood cells live for about four months, while white blood cells live on average more than a year. Skin cells live about two or three weeks. Colon cells have it rough: They die off after about four days. Sperm cells have a life span of only about three days, while brain cells typically last an entire lifetime (neurons in the cerebral cortex, for example, are not replaced when they die). The tiny seed knew that in order to grow, It needed to be dropped in dirt, covered in darkness and struggle to reach the light.